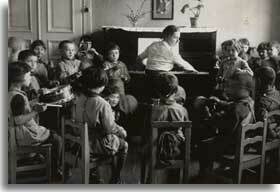 A kindergarten music class in a school by the Society to Support the Poor Jewish Child (Kaunas/Kovno, Lithuania, 1930s). Music played a central role in Jewish life in Eastern Europe. As in Jewish communities worldwide, East European Jews continued the ancient musical traditions connected with synagogue prayer and public reading from the Torah . To this were added more recent religious songs for Shabes and holidays, based on medieval texts and melodies. Yet at the same time as they preserved their musical past, the Jews of Eastern Europe also actively created completely new kinds of Jewish music. The Hasidic movement that sprang to life in 18th-century Eastern Europe transformed Jewish society worldwide through its thousands of new, soulful, wordless melodies known as nigunim. Outside of the synagogue, Yiddish folk songs began to appear as part of all sorts of life situations, ranging from beautiful songs of romance and love, to children's lullabies, to epic ballads about famous historical events. Communal celebration was also a major theme and inspired creation of new styles of Jewish music in Eastern Europe. Jewish professional musicians developed klezmer music, an original style of folk music that transformed weddings in Eastern Europe into all-night dance parties. The holiday of Purim emerged as an occasion for elaborate musical plays poking fun at the leaders of the community, a custom which later evolved into the secular Yiddish theater. Modern times also spawned other innovation in Jewish music, including songs and anthems for political causes and groups such as the Zionist youth movement and the Bund ; Russian Jewish classical music; and Holocaust-era songs of resistance and remembrance. In more recent times, many of the great East European Jewish musical traditions have gained a renewed and even expanded popularity, as contemporary Yiddish music finds enthusiasts among Jews and non-Jews around the world. The Jews of Eastern Europe inherited a rich tradition of religious (or liturgical) music stretching back to its earliest roots in the Bible. Religious music varied enormously in terms of form and function. In the synagogue, Jewish prayer was centered on ancient texts, which were mostly sung in a melodic chant. Musically, this was a collection of free-flowing melodies without fixed rhythm called the nusakh. During the regular Shabes reading from the Torah, and on holidays, a special set of short and distinctive traditional melodies called trope was used. Torah melodies were handed down from ancient times, and like the texts of the prayers, they were meant to remain constant and unchanged throughout the centuries. Many sections of the liturgy were chanted or sung by individuals, and others chanted together by the entire congregation. While the texts of Jewish prayers were preserved through written prayer books, the music was part of an oral tradition, passed on from place to place, and generation to generation, by the informal prayerleaders who ran the services. Eventually, among Ashkenazi Jewry, there developed a specific occupational role connected to synagogue music and singing: the hazzan or cantor. 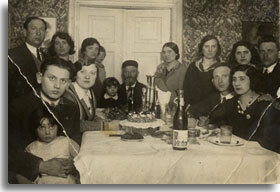 Portrait of a family gathering at the end of a meal (Zyrardow, Poland, date unknown). Beside the ancient prayers and Torah readings, there was always a large space left in the service for religious songs. These songs, called piyyutim , were really religious poems, written in Hebrew and Aramaic, sung to a whole range of melodies, some old, some newly composed, and some adopted and adapted from neighboring cultures' folk songs. Piyyutim first appeared in the synagogue service around the 7th century C.E. Over time, some piyyutim proved to be so popular that they became permanent parts of the synagogue prayers. This was particularly true of the compositions of famous medieval Hebrew poets. By late medieval times, piyyutim had begun to change in both form and function. They began to appear in other settings than the synagogue in East European Jewish communities, in particular at family religious celebrations such as the Shabes table and on other holidays. In addition, a variety of people began to compose and perform them. The most powerful piyyutim were often written by anonymous pious Jews. These include the unique tekhines composed by Jewish women in Eastern Europe, which are some of the oldest and most powerful examples of spiritual writing by women.